Main Road: fun times from one end to the other! This week the weather has been changeable with some days sunny and others with clouds and a steady rain. Whatever the weather, nothing will stop some activities I have been watching on Main Road. Right at the four-way stop at Lobdell Point Road, The Albatross is open ... DAILY! Let the lines for ice cream begin. Oh, wait! They already have! 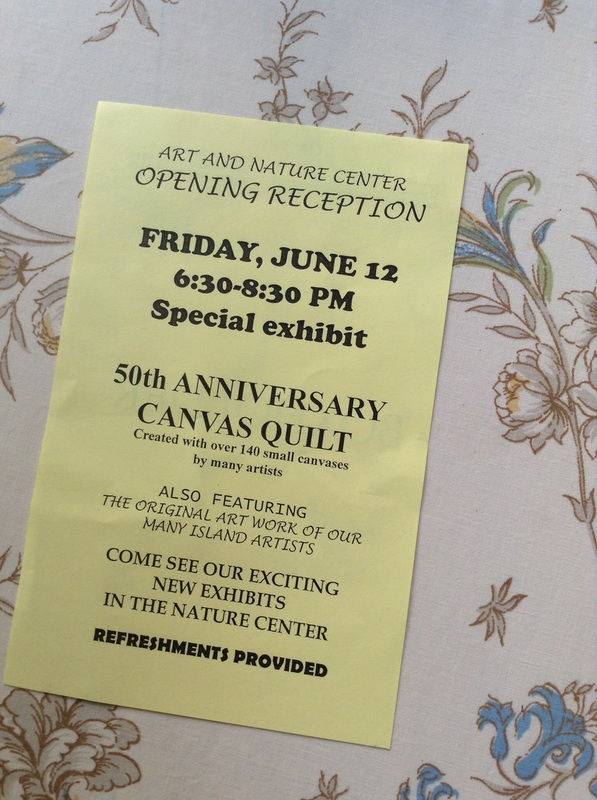 Just down from the Alby, a banner announces the 50th Anniversary of the Washington Island Art & Nature Center. Lots of planning (and hard work!) has been going on for this special year at the ANC. Mother Nature gives us a break though with a lovely display of lilacs at several locations on Main Road. Not many towns or cities can say they are home to several functioning farms. The Island can! There are timely things to notice and worth a pause, as traffic will allow. As I stopped to take a look, I did a double take when I saw not one but two young ones! Just past the livestock comes the location of a big event today and that is the opening reception of the Art & Nature Center. These two ladies are responsible for much of the preparation for this Island non-profit's Anniversary Season and they take little credit. The person with the "Yes, this will all get done" look is artist Cathy Meader. I think it is evident that Cathy is a former teacher ... it is that look. She is spearheading the Anniversary Canvas Quilt Project. This includes sending, receiving, and organizing 140 to 150 8X10 canvases. Laura Waldron is the ANC Director. Laura wil be hanging all the work brought in by artists in the remainder of the gallery. The artists have been busy over the Winter! A wide variety of pieces wait patiently in a process that Laura has enjoyed over her years as Director. Cathy has organized the quilt as well as the system which will keep the "winners" of each painting a secret until they are distributed at the Anniversary Party in July. The proceeds for these artist donated "Quilt Blocks" will subsidize the refurbishing efforts of the former Washington Harbor Schoolhouse where the ANC is housed. The building harkens back to its 1904 roots and needs a little -maybe not so little- help. Do stop and see the new storage shed as it nears completion. Over the years, materials for events have evolved and space to store said supplies has had to be reconsidered. The new shed replaces other structures on the property. to find out or call the ANC @ (920) 847-2025. Do message me at Island Mettle on Facebook or in the Comments below if I can be of help. By the way, there is a nifty Summer planned for the ANC's neighbor, Bethel Church, as well but that deserves its own post. Here's to having a fun time on Main Road this Summer!